Following the success of the limited edition Laureato re-presented in 2016 as part of the Girard-Perregaux 225th Anniversary celebration, the brand now introduces a complete Laureato collection for men and ladies with nearly 30 references, all equipped with Manufacture tourbillon, self-winding or quartz movements, housed in cases available in four diameters in versions of steel, gold, two-tone steel & gold or featuring titanium elements. All are defined by the polished octagonal bezel inside a round integrated case (no lugs,) and dials with the “Clous de Paris” hobnail motif. Some of the bezels are diamond set. Available with flexible metal bracelet, or alligator leather strap delivered with an additional rubber strap and tool. Prices range from $8,800 to $31,000 for the 34mm; $9,700 to $34,300 for the 38mm, $10,300 to $22,600 for the 42mm and $93,700 to $98,400 for the 45mm Tourbillon. When the brand’s stylish 1966 collection meets the Manufacture WW.TC (World Wide Time Control) model characterised by crowns on either side of the case, the result is the new 40 mm 1966 WW.TC that enables instant and simultaneous readings of the time in 24 cities around the world. Easy-to-read and easy-to-use, the 1966 WW.TC – the first of the 1966 collection to provide a world time complication – features a rotating 24-hour disc with two black/white semi-circles to distinguish day and night, surrounding the chapter ring. Settings are made via the two crowns at 9 and 3 o’clock, with the first serving to position the reference city at noon, while the second adjusts the hours and minutes – with which the 24-hour disc is automatically synchronised. The automatic Manufacture movement is fitted with an additional in-house module that enables the time and reference city to be set in both directions. Power reserve of 46 hours, with the sweep of the small seconds hand at 6 o’clock serving as a reliable operating indicator. $12,300 in stainless steel. $23,800 in rose gold with alligator leather strap. Girard-Perregaux moves decidedly into the future with the captivating architecture of the Neo-Bridges Automatic Titanium. Its alternately polished and satin-brushed 45mm x 12.17 mm thick titanium case is fitted with a sapphire crystal and minimalist dial – a ring with suspended indexes and luminescent skeleton hands — providing a superb view of the new GP08400 self-winding movement with a micro-rotor that appears to be inseparable from the case, thanks to its positioning along the same axis as the barrel drum. Contemporary finishing including sandblasting and PVD coating on delicately curved bridges along with a sophisticated graphic design showing a large variable-inertia balance wheel at 6 o’clock result in a striking ultra-modern look. 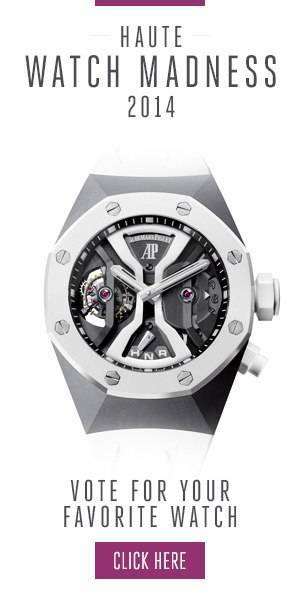 Power reserve of 48 hours, functions of hours and minutes, water resistance of 30 meters. $24,000 on dark-grey / black alligator leather strap with titanium triple folding buckle. The Tri-Axial Planetarium is a superb example of the high-precision movements and aesthetic harmony for which Girard-Perregaux is famous. Combining a Tri-Axial tourbillon (developed in 2014) and two beautiful miniature-painted complications — a rotating globe with day/night indication that makes one full turn in 24 hours, and a precision moon phase display — this timepiece also features arrow-shaped gold bridges, lyre-shaped tourbillon carriage, sapphire domes and side opening to let in the light, all signatures of the brand. The cartography of the globe depicts the world as it was seen in 1791, the year the brand was created, while the lunar disc shows us the selenography of the 17th century when the telescope was invented. A dedicated corrector at 2 o’clock enables you to adjust the astronomical moon-phase indicator when required, that is, once every 122 years. The 48 mm-diameter pink gold case features a signature curved case middle, bevelled bezel and cambered lugs. Two domes on the three-part sapphire crystal provide space for the rotation of the tri-axial tourbillon and the globe; the hand-winding Manufacture GP09310-0001 calibre drives the hours, minutes, moon-phase and day/night functions indicated on a silver-toned guilloché dial. With a power reserve of 70 hours, this timepiece is fitted with a black alligator leather strap with pink gold folding clasp. Priced at $291,000. Our final highlight is designed specifically for ladies’ wrists. This new version of the Cat’s Eye, the Cat’s Eye Celestial with large moon phase indicator, features the very feminine oval 35.40 x 30.40 pink gold case set with 62 brilliant-cut diamonds. On the polished and guilloché mother-of-pearl dial, an aventurine sky and marquetry of mother-of-pearl compose the moon phases indication, while brilliant-cut diamonds mark the hours. Equipped with an automatic Manufacture movement with 46 hours of power reserve, this new timepiece is water resistant to 30 meters. $30,400 on alligator leather strap. $45,300 with rose gold bracelet.